I’m a big boy and while that may seem like a reference to a restaurant famous for the “Double Decker,” with a large plastic smiling boy outside, it isn’t. I am 6’2″ and about 250 LBS of craft beer drinking and Burger lovin’ man. I try to do some cardio 4-5 times a week to keep my “boyish” figure from turning to “big” so I end up walking all over NYC. 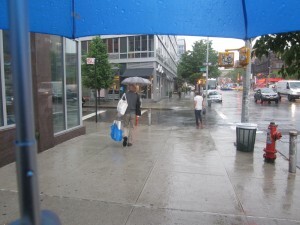 Yesterday, on my quest to eat 31 Burgers in 31 days for National Hamburger Month I had to walk nearly a mile in the pouring rain to get my daily Burger. By the time I arrived at my destination I was soaking, freaking wet which made me feel like I was 300 LBs. With hours before I would have the opportunity to change into clean clothes, I sure could’ve used a pair of red suspender to change into. 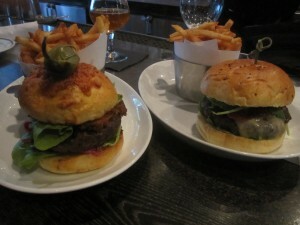 Day #18 of National Hamburger Month brought me to Daniel Boulud’s DBGB. The DBGB Kitchen & Bar is Chef Daniel Boulud’s French brasserie gone sausage filled modern tavern. The restaurant lies just above Houston St off of the Bowery. 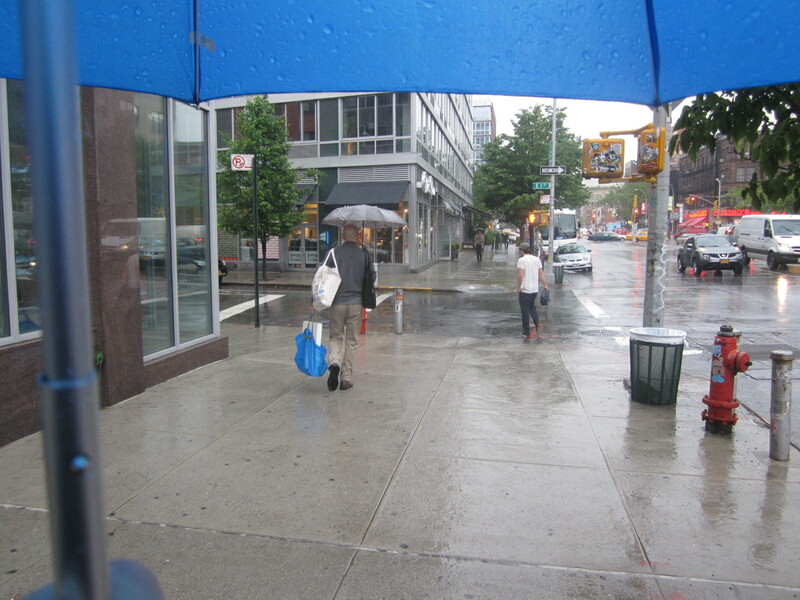 You’ll see the entrance in the photo below, just beyond the washed out view from underneath my blue umbrella. The DBGB menu is most know by foodies like myself for the large and unique array of artisan sausages. I’ve not eaten them all, but I have definitely tried several times. DBGB also has a couple of really cool and tasty Burgers that brings them a lot of accolade. 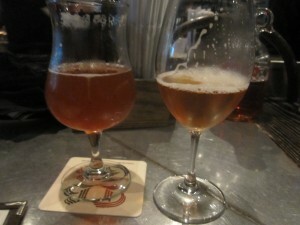 All of their menu is balanced with a cornucopia of diverse craft beers from around the world. 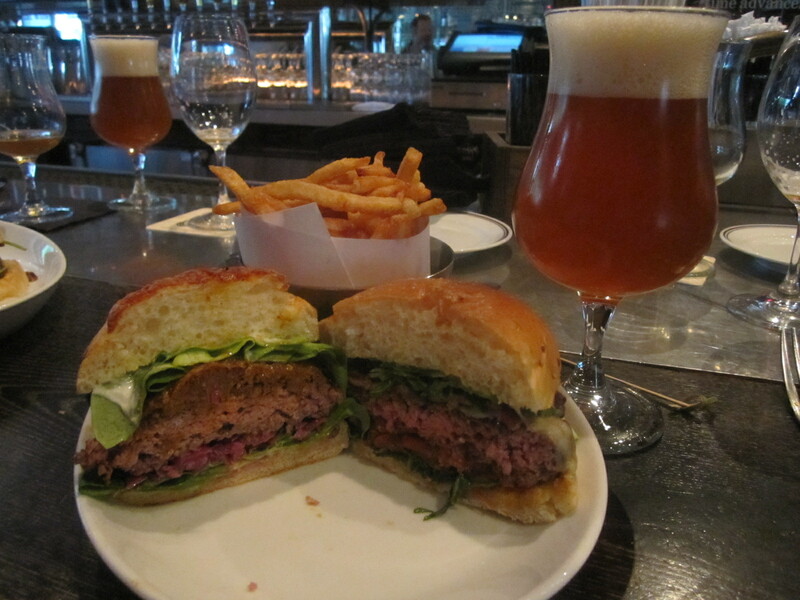 It’s because of that beer menu that my buddy Phil invited me out to join him for a Burger and Beer pairing to celebrate National Hamburger Month. Phil works for Manhattan Beer Distributors, one of New York City’s premier distributors for craft beer. Phil was incredibly helpful when we were getting ready to launch my bar, Idle Hands. 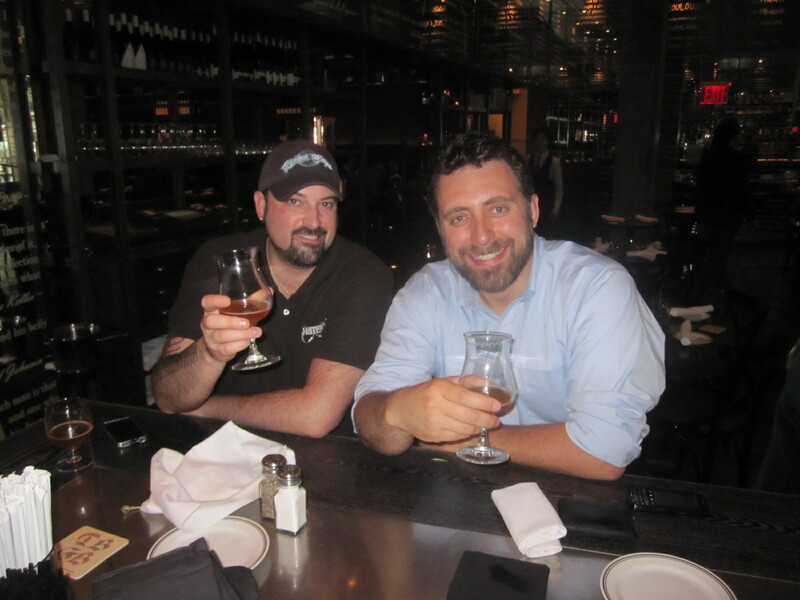 Phil helped to expose me to a lot of great beers from breweries we now carry such as Sly Fox, Peak Organic, 21st Amendment, Arcadia, Fire Island, Captain Lawrence, Ithaca, Southampton Publick House and many. many more. Phil has an incredibly deep knowledge of craft beer and the brewing process but never comes across as a snob or know-it-all. His passion for great beers has had a massive influence on my appreciation for them and therefore, I love hanging out and having beer with Phil. THEY SAY: Even before drinking it, you’re surprised by the explosion of fruity aromas from the dry-hopping with American hops. But the adventure only starts here. The combination of a Belgian Triple style body with a nice balanced IPA (Indian Pale Ale) bitterness takes you on a long trip of sensations. REV SAYS: For being an Imperial Double, it’s really mild in taste. It’s like the difference between high and low grit sandpaper, intense but still delicate. Phil and I decided that beer this tasty and unique should be paired not with one Burger but with two! We decided to split 2 of the 3 Burgers offered at DBGB. 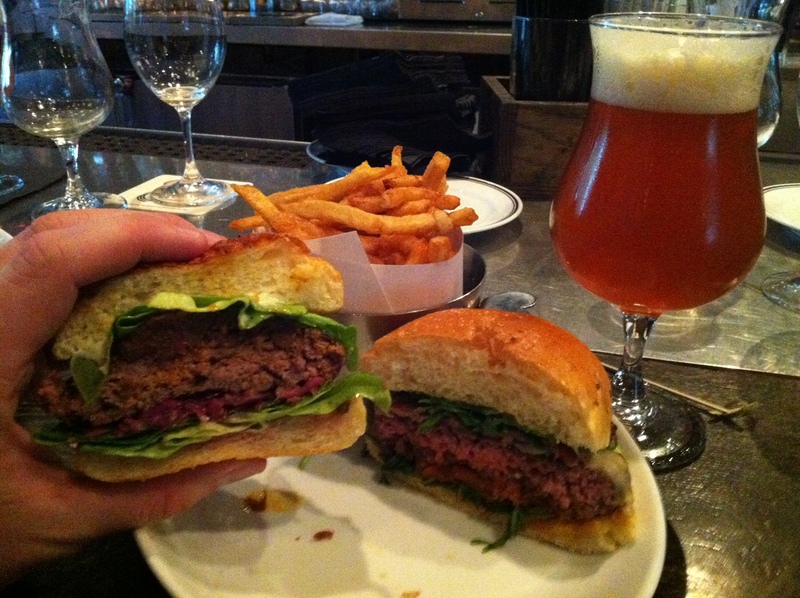 The Yankee – 6 oz Beef patty with Iceberg, Tomato & Vidalia Onion on a Sesame Bun and an Essex St. Pickle. The Tomato & Onion preparation came across very much like an Italian Red Sauce. It’s citric nature was very tangy and the clear dominant flavor in the sandwich. Somewhere near the end of my half of the Burger someone popped in a small dollop of what I believe was horseradish. I don’t think it was intentional but I actually enjoyed it. The Piggie – 6 oz Beef patty topped with Daisy May’s BBQ Pulled Pork, Jalapeno Mayonnaise & Boston Lettuce on a Cheddar Bun with Mustard-Vinegar Slaw. The Piggie, which I have reviewed before, is a really great Sandwich. The Pulled Pork has a fantastic smoked flavor with what I would consider just the right amount of sweet BBQ flavor. It’s easy to over do the sauce when making Pulled Pork and that is NOT the case here. Overall this has a really crazy rainbow of flavors that will have your tongue on a crazy tasting ride. Both of these Burgers at DBGBs are served on really nice, freshly ground Beef however, the toppings are the star of the show. If you’re a toppings person, this is your Burger. If you’re just into interesting and unique flavors … and delicious craft beer pairings, DBGB is your restaurant. DBGB Kitchen & Bar scores a 7 on The Rev Meter. 10 points Congrats on a perfect score! Are you hiring? This entry was posted in Beer, Burgers, Gourmet Burgers, Hamburgers, National Hamburger Month, New York and tagged beer, beer pairings, Brouwerij The Musketeers, burger, cheese, ciancio, conquest, craft beer, daniel boulud, dbgb, french, frenchie, fries, great, hamburger, magma, manhattan beer, micro, new york, ny, nyc, piggie, rev, review, the, the rev meter for social community, troubadour. Bookmark the permalink.